Soaring Sierra was about 12 weeks old when she was adopted in 1998. She was covered in sap along with over 40 fleas crawling on her body. After a long flea bath, she turned into the cutest little fur ball ever seen. It didn’t take long before I fell in love with this little girl. She was anwry, silly, goofy, playful, and loving all at the same time. It wasn’t uncommon for her to vocalize herself when she wanted a toy or attention. To this day she still growls the moment she snatches a flying disc out of the air. Sierra is definitely the most talkative of the pack. She is the type of dog that won’t let you get a word in as you walk in the door. The “woo, woo, woos” won’t stop until you give her the attention she demands. Sierra wasn’t the most driven Border Collie as a young pup. In fact, she would regularly loose focus and just not want to play. This was discouraging because my first Extreme Canine Stunt Dog (“Extreme Pepper”) had the most insane toy drive ever seen. Sierra just loved to receive attention more than playing. Her drive was built by keeping the training sessions short and always ending when she still wanted more. The use of treats helped keep her focused when teaching fun tricks like dancing on her hind legs, rolling over, spinning, shake, and play dead. But the lack of toy drive was a serious concern as I don’t like to rely on treats when performing with my dogs. Sierra regularly went to disc dog play dates, competitions, pet stores, and trips. She always had her tail tucked between her legs. 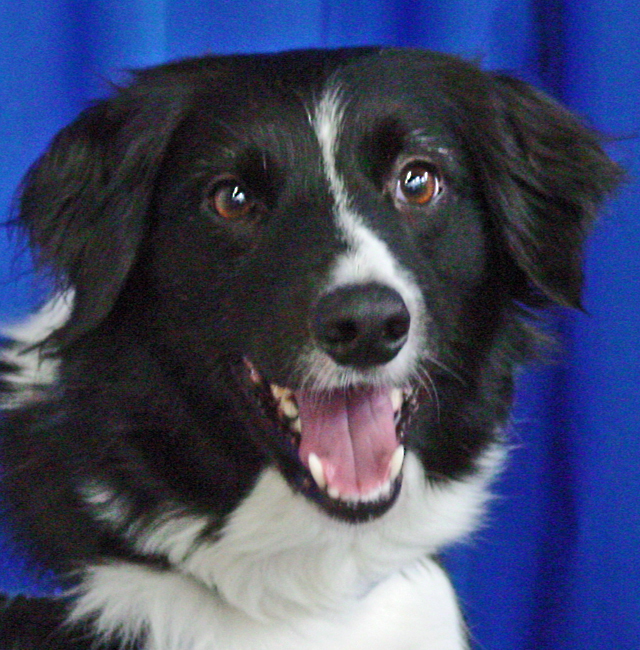 This extremely shy border collie lacked confidence in herself outside of her own environment. Things changed at the end of 1999 when I was called to perform in Los Angeles. At the time, I only had three dogs: Extreme Pepper, Soaring Sierra, and Jumping Jaz. The two main stars were, of course Pepper and Jaz, since Sierra still wouldn’t perform in front of an audience. I decided to take Sierra for the experience and exposure. There was no pressure as I was keeping her as a pet even if she would never perform. My dogs have and always will be my pets first and performers second. When we arrived in Los Angeles, Sierra was nervous as usual. The convention center was bustling with people. Pepper and Jaz were as cool as could be and were ready to perform. Poor little Sierra had her tail tucked in so far, you couldn’t even see she had one! Nobody could tell because both of the other dogs had stubs as tails. Everybody probably assumed Sierra had a stub too. It wasn’t until the end of the show when the magical moment took place. I started to end the show, when the lady who was holding Sierra’s leash, tapped me on the shoulder and asked, “When is it her turn”? With sad eyes I said, “She doesn’t have a turn”. She responded, “But she looks like she is ready to go”! I looked down and what I saw was simply unbelievable. Sierra had been pulling on the leash the whole time trying to get out to play. After watching the other dogs perform and hearing the audience reaction, she was ready to go! I decided to let her off the leash and see what she would do. Sierra flew into the performance ring with vigor, picked up a Frisbee, and ran right back to me. Her eyes had finally transformed and she was ready to perform. I introduced Sierra as my newest star then proceeded to take her through the motions of doing all her tricks, just like she did at home. To my amazement she didn’t miss a beat! She was soaring, spinning, jumping, and flying; and the crowd loved her! It took everything for me to hold back the tears of joy. Sierra performed the whole next season, but only if her buddies Pepper and Jaz were with her. It wasn’t until almost a year later when she finally gained the confidence to perform solo. Soaring Sierra will be 11 years old this July and is currently still performing. 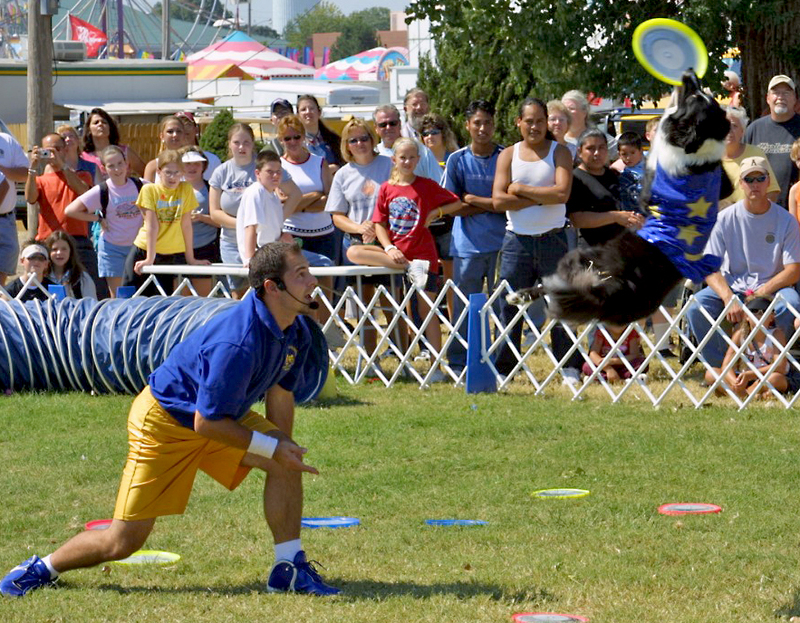 She has starred in more shows than any other Extreme Canine Stunt Dog in history. However, last September Sierra was diagnosed with cancer and had a large tumor removed from under her tail. She is currently in good health with only minor complications along with being on a special diet. I’m not sure how many more shows she has left in her, so I’ve been cherishing every moment we have together. Soaring Sierra’s most memorable career moments include winning an episode of the first season of Animal Planets Pet Stars with Mario Lopez; with a perfect 30 score. Sierra has also starred in two commercials, has been featured in Dogs for Kids magazine, and was the poster dog for the “K9 Sport” dog supplement by Pet Max Naturals. Soaring Sierra is a beautiful dog & adopting a dog from the shelter or a pound is the right thing to do. Today I lost my daughter…. Soaring Sierra (7-2-98 to 2-9-10) was a champion and a pet star! I will forever cherish having her in my life for the almost 12 years I spent loving her. She absolutely loved life and was the most happy go lucky girl I’ve ever had. When you asked her what kind of fun she was having, it was …always “Wooo woo woo” which was translated to “Dog Gone Fun”. She was my miracle dog! I first met Soaring Sierra through Pet Star (she was perfect!) She is your one-in-a-million dog, and you are truly lucky to have had her in your life, and she is equally lucky. I know how you loved her, and I’m so sorry for your loss. Deeply sorry Sierra passed away Bud. I can remember years ago when she wanted nothing to do with performing and then her transformation into the Pet Star that she was. She will be missed by all. I know you loved her alot and I know she loved you just as much. Always remember you both let each other have better lifes. Sierra was a bright light and a shinning star! She had amazing energy and was so happy in life. Sierra became a crowd favorite to watch perform during the Extreme Canines Show because you could always tell she had an amazing time doing what she loved. I will always cherish her “whoo, whoo, whoo’s” !! She was such a success story being rescued and becoming a wonderful pet, and it was only an added bonus that she turned into a wonderful performer and star. She was one in a million and I will miss her dearly! Soaring had a ton of heart that she shared with more people than she ever could have imagined. Whether she was opening the show with frisbee or closing it by catching discs for kids at the end, she brought this carefree energy to the field that none of the other dogs had. Si was always my favorite, and she knew it and milked it for all it was worth. = ) She was given the best life a dog could have. I’m so relieved she is now in a place where she doesn’t have to battle cancer or fight to live. And luckily, she has left us all with so many happy memories that can hopefully allow us to forever celebrate the special dog she was and will always be. I remember Sierra when you first adopted her many years ago. She was so very sweet, sensitive, happy go lucky, and lovable. We will miss that little darling of a dogger.